Visit the Yucatan coast near Contoy Island, which is one of the most beautiful coasts in the Yucatan Peninsula. 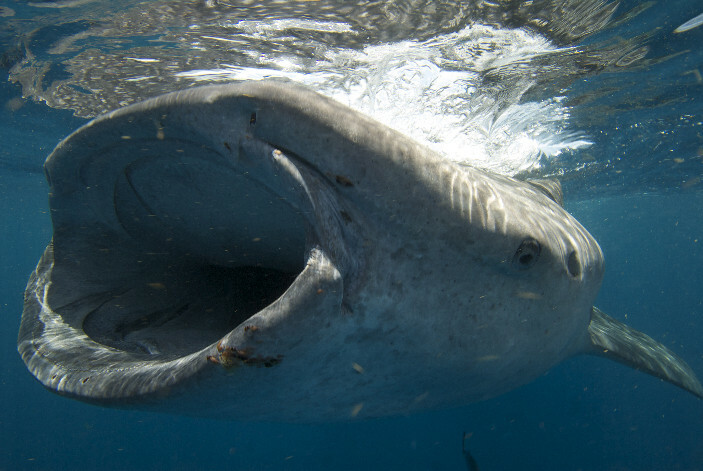 Enjoy a great day getting to see and snorkel with the biggest fish in the World, the harmless whale shark!! Snorkel on a coral reef to admire the different aquatic species in the Caribbean. Also enjoy bird watching as we pass Contoy reserve. And as an extra bonus we usually get to admire Dolphins, Mantas, Marine Turtles and many other Bird Species along the way. Remember we are PIONEERS IN WHALE SHARK TOURS. Cancún yucatán whale shark history: To think of a fish that can be 18 meters long sounds a little prehistorical, even more when we are told that it is herbivorous and it lives in these days distributed among the warm waters of the world. It's fascinating to think that the same water where swimmers enjoy summer, this gigantic animal lives. This creature is really a fish but people include the name whale because his enormous size. Whale sharks are essential animals in the ocean. According to experts, to catch these animals could produce terrible disasters in the ocean's balance. This is why every place this creature visits, ecotourism program that protect it and inform to the people about the characteristics and situation that this huge animal is facing are developed. The eco - tour size is limited to 10 persons per boat. 1. Our Guarantee - if you do not see the whales with us you can come again for free until you do - for life, no expiry. 3. 100% success rate. We have only missed 3 times in 6 years of operation. 4. Great probability of manta, marine turtles and dolphin observation. 5. Professional Naturalists discuss the marine eco-systems and answer questions. 6. Working with local community; Our company has trained local guides in the area. You could call it a whale of a "swarm"—the biggest observed gathering of whale sharks was spotted off the coast of Mexico's Yucatán Peninsula (see map) in 2009, according to a recent study. Snapped from a small plane, the above picture shows a white boat (bottom right) amid the fishy gathering. But aerial and surface surveys spotted at least 420 of the sharks rubbing fins as they gorged on eggs freshly spawned by little tunny fish, a relative of the mackerel. "To see a group of that many all in one place was phenomenal—to the point where you couldn't navigate a boat through that without having concern for the fish. That's impressive," said study co-author Mike Maslanka, head of the Nutrition Science Department at the Smithsonian Conservation Biology Institute in Virginia. Other organizations that contributed to the study include the Comisión Nacional de Áreas Naturales Protegidas in Cancún, Mexico; the Center for Shark Research in Sarasota, Florida; the Mexico-based conservation group Project Domino; and Atlanta's Georgia Aquarium. "It doesn't go understated that they're not small animals," added Maslanka, whose study was published in April in the journal PLoS ONE. "You don't realize how big they are until you're swimming beside them or you pull a boat up next to them." Looking like rice grains, four boats carefully weave through the 2009 whale shark swarm in an aerial picture. There's no evidence the fish were interacting or working together to catch more food, as dolphins sometimes do by herding schools of fish, Maslanka said. "They're big animals, but their brains aren't all that big." But the assembly did reveal a new spawning ground for little tunny—as well as a new aspect of whale shark behavior, he said. Instead of stuffing themselves to the gills and moving on after one spawning event, as scientists had suspected, the sharks hung around for a while to take advantage of successive spawnings. A photographer snaps a whale shark feeding near Isla Mujeres, Mexico, in an undated picture taken during a separate whale shark aggregation. Whale sharks predictably congregate along Mexico's eastern coast each summer, but where they roam the rest of the year remains a puzzle, Maslanka noted. "How populations are linked, if they're linked, what mixing takes place in terms of genes, whether there's any passage between the Atlantic and Pacific populations—it all still remains to be seen." The whale shark (like this one pictured off Mexico's Isla Mujeres in an undated photo) is a filter feeder. To gather its food, the beast juts out its formidable jaws to take in plankton-filled water. It then closes its mouth and opens its gill flaps, using the tooth-like dermal denticles lining its gills as a sieve to catch any organisms bigger than two to three millimeters wide. Snorkelers swim with whale sharks off Isla Mujeres in an undated file picture. Whale shark ecotourism is blooming in this region of Mexico, which is close to the major tourism hub of Cancún, Maslanka said. 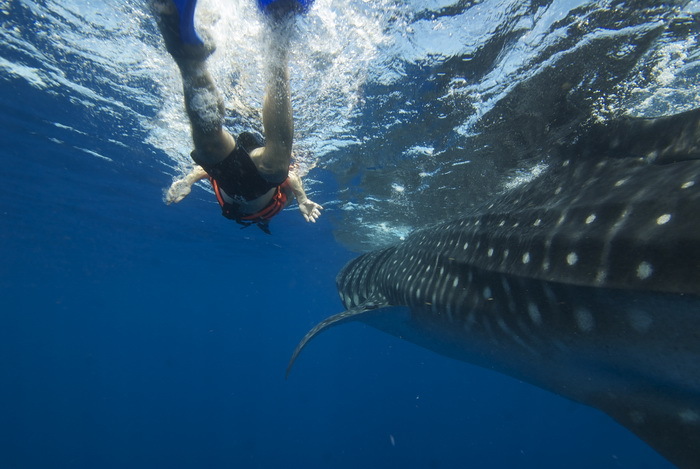 Overall, tour companies have done well in establishing rules to keep the whale sharks safe—for example by not allowing people to touch the sharks and limiting the number of swimmers in the water at one time. In a file picture, snorkelers and whale sharks surround a boat in Isla Mujeres. Due to fishing, the whale shark is listed as "vulnerable" by the International Union for Conservation of Nature. The animals continue to be hunted in parts of Asia, primarily for their meat, liver oil, and fins.